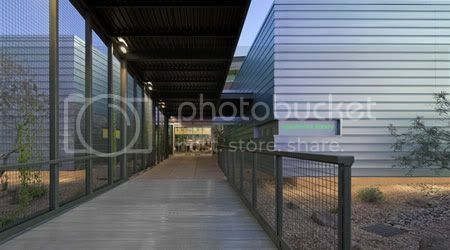 As you approach the library, the building’s metal skin changes colors- It’s primarily silver-gray straight on, and then as you get off to an angle you see a grayish green, as you get flatter to it, it goes dark green or a purplish color. As you’re driving up to it some of the walls look bright pink and some look bright green, creating the mirage effect. Design Team: DWL Architects + Planners Inc. 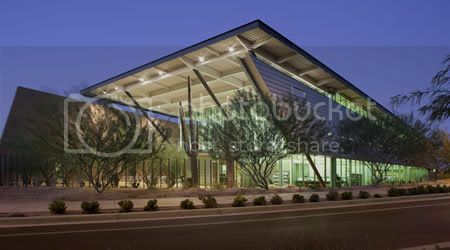 Designed in collaboration with Douglas Sydnor Architect and Associates, the Appaloosa Branch Library design theme celebrates the environment in a protected desert setting. They surveyed the site and decided they didn’t need to go back to historical precedent, or design something that would conform to what might work in other parts of the country. Instead they wanted something thoroughly modern and functional, with the crispness of steel design. They were creating something in the desert, so they decided they might as well create something for the desert. Rising from a very functional plan, the 21,500 s.f. 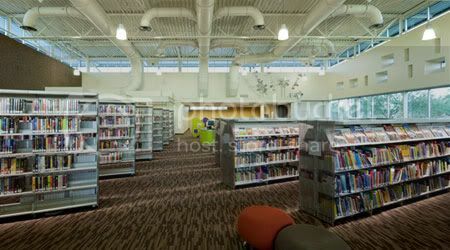 library concentrates its interior drama in a single large Reading Room that is 70 feet wide and 130 feet long. The space is naturally lit with indirect light that changes during the day but rarely enters the room directly. Sunsets will color the whole room with changing shades of pink and orange, while thunderstorms will be visible wherever they occur. The Reading Room is separated from staff spaces and meeting rooms by a massive geologically-layered concrete wall. Rooms along the south side are wrapped in iridescent metal and float a few feet above the arroyo. At the west end, the building digs into the earth, but at the east end it opens onto a patio with filtered views of the McDowell Mountains. On the north side of the building, small windows actually form Morse code spelling out "Appaloosa." It was built to meet LEED Gold standards and has many "green" features, including photo voltaic cells, minimized water usage, roof designed to minimize heat island effect, minimal chemical usage during construction and operation and so much more. In addition, it was situated to avoid as much direct sunlight as possible. 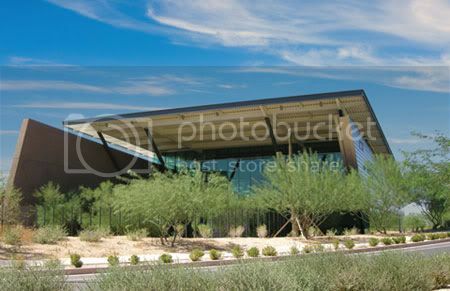 e.
As the only city building in northern Scottsdale, the Appaloosa branch functions as a public meeting place for residents. There is a café that serves as a “newsroom” where people often come and have coffee while they read the newspaper and watch the news.